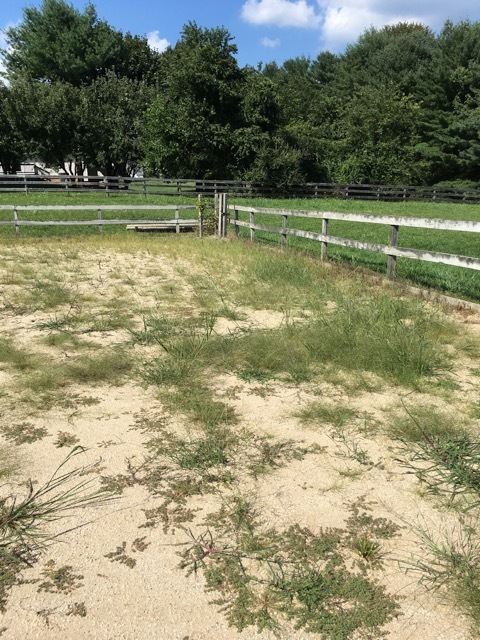 While kneeling in the sand and weeding by hand my riding arena (yes, I do this because I am obsessive compulsive about weeds) it occurred to me that the task was a lot like writing a novel. How so? I looked at the overgrowth of weeds invading my ring and resolved to do something about it. I had the will. But as soon as the heat and the magnitude of the task pressed down on me, I was compelled to quit. What does this have to do with writing? A lot of times I have a great idea and I sketch out the plan and dive into writing, only to feel that “deer in headlights” immobility when I look at the magnitude of the task ahead of me. Can I really flesh out these characters, spin a compelling plot, unravel the problems, give it a theme and make it marketable to a capricious and demanding readership? No! No, I can’t do it. I want to run away and give up. Like the weeding task, I want to abandon ship and leave it to the professionals. But. Taking a deep breath. I see that when I go out and do a little bit, even a small amount each night, I do make progress. The results are starting to show. If I keep working and don’t lift my eyes to take in the daunting task ahead, I can maintain hope. It is just that simple. Plodding. Don’t look at the bigger task, just the little patch ahead of you. And pull.